That’s all I have to say about that…and I had to modify my T-shirt, too. Three breast surgeries have taken their toll on my girlish figure. 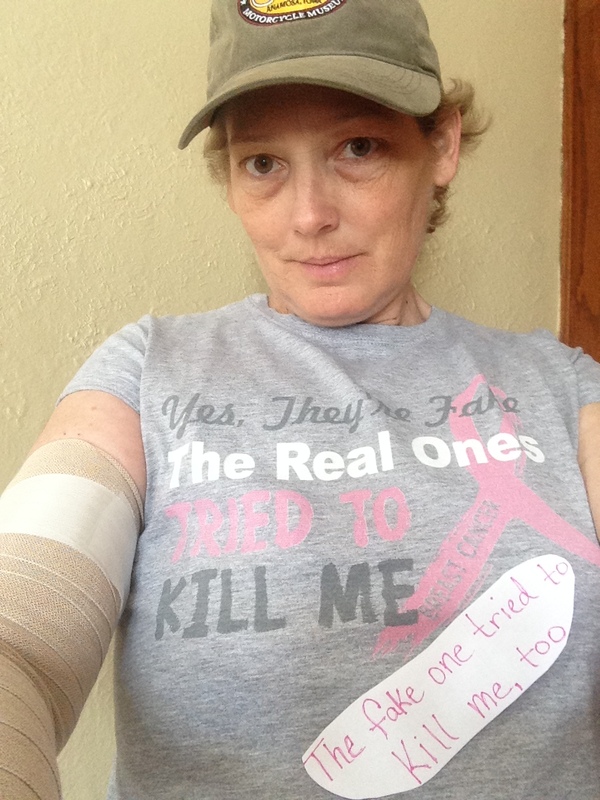 I’ve gone from breasts to tissue expanders to foobs, and now, to one foob and one…notfoob…(such are the hills and valleys of a breast cancer journey, after all). Despite my odd aesthetic, I’m happy to report that the surgery went remarkably well, and I’m feeling great. I finally had an anesthesiologist concoct the right mixture of meds to keep me from getting sick. Seventh surgery’s a charm, apparently. I arrived at 8:30, went through the usual pre-surgery routine, and in no time, I was wheeled off in the comfort of my recliner. I tried to convince the nurse to pop a wheelie on the way to the OR, but she just laughed. I think she thought I was kidding. Settling into position for surgery this time, I made it clear that I did NOT want a repeat of the nerve damage the last surgery caused me. Luckily, my anesthesiologist bent over backwards to make sure my arms were propped up to prevent over-extending the nerve. Once she was sure I was comfortable, they duct-taped (okay, maybe it wasn’t duct tape…) my arms into position, and brought out the oxygen mask. They instructed me to take deep breaths and imagine a beautiful beach scene. The nurses asked me to take them all with me to the beach (this was one of those lovely sub-zero Wisconsin days), but I thought better of sharing the oxygen mask with them. A sharp, burning pain into my IV got my attention, but they reminded me to continue with my deep breaths. One, Two…Out Cold. The next thing I remember is hearing Andy’s voice in the recovery room. Recovery has been a breeze. I woke up, gradually, without even a hint of queasiness. I felt great, and by 1:00, I was on my way home to heal. I had almost immediate relief from the pain, cording and swelling brought on by the infection, providing confirmation that I made the right decision to remove the implant. By Tuesday, I was up and about, antsy to get out of the house and take a walk. I didn’t even need the pain pills by Tuesday night. Wednesday was the first day I was allowed to remove the dressing and take a shower. I was anxious, and nervous, to see what this third breast surgery did to my body. I was a bit taken aback at the concave profile of my right chest, but I’m taking it in stride. It’s just surprising how little tissue there is left. It feels like a small amount of skin sitting directly on hard ribs. I still have the alloderm (donor skin tissue used with mastectomy to recreate the structure and contoured curve under the breast) in place from the original surgery, so there is a curve under what should be a breast, but now is a valley. It will take some getting used to, but I’m healing extremely fast and feeling really good.